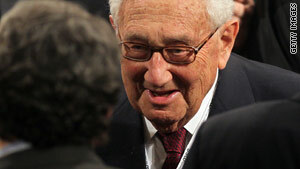 Former U.S. Secretary of State Henry Kissinger is recovering after he was briefly hospitalized for stomach pains. Seoul, South Korea (CNN) -- Former U.S. Secretary of State Henry Kissinger was discharged from a hospital in Seoul on Sunday after being treated for a stomach virus. He is "in good spirits," said Dr. John Linton of Yonsei Severance Hospital. Kissinger was hospitalized Saturday. A special medical team conducted a check-up and an MRI scan and took X-rays, but found nothing serious, hospital staffers said. Kissinger, 86, arrived in the South Korean capital Wednesday for a security forum and met with President Lee Myung-bak on Friday. Kissinger, who chairs an eponymous consulting firm, served as secretary of state in the 1970s under presidents Richard Nixon and Gerald Ford. He had triple bypass surgery in 1982 and an angioplasty in New York five years ago.